Please. anybody has an idea how to fix my problem? i'm going on trip tomorrow. really need to use my gps unit. I screwed up big time. please, would really appreciate if somebody has an idea how to fix this. my unit wont turn on at all. just display the garmin logo. and then automatically turn off again. 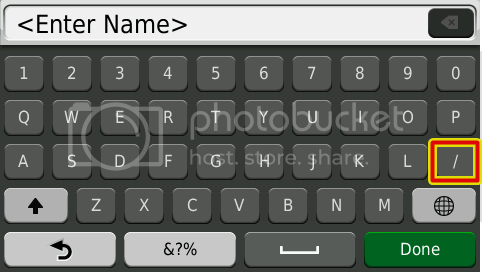 I just modify and add the "/" button at the main page of qwerty keyboard. see the picture below, hope can help who's is always use "/" button to search the address. 1) at the qwerty keyboard, press the globe icon. 3) u will see the "/" button at the main page. some user feedback 2465,2567,2575,LM40&LM50 also can use. Use for your own risk. u all can modify yourself. Use notepad++ to modify. Refer my edit file. All new nuvi is same. if u want me help u to edit also can, u upload your en_us.kbd to me. Last edited by benson208 on Sat Nov 03, 2012 11:41 pm, edited 1 time in total. benson208 wrote: I just modify and add the "/" button at the main page of qwerty keyboard. bro! I've been looking for this for quite some time and it works on my 2575R. For fun, I have just modified a British English keyboard for nuvi 2xxx series to add short-cuts to popular words in our MfM map. To access the short cuts, press 'Alt' on the keyboard. Unzip the 7z file, and copy the KBD file to the nuvi drive under the \keyboards folder. 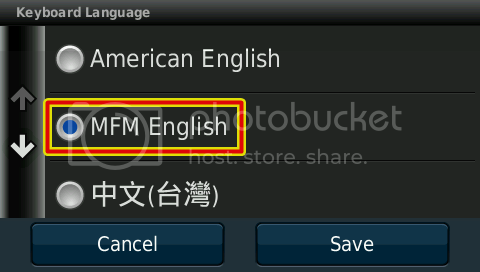 Once you have copied my KBD file to your nuvi and you have restarted the nuvi in Garmin mode, go to Tools > Settings > Language > Keyboard Language and select "MFM English". I have tested this keyboard on a nuvi 2465 and a 2575R, but I can't vouch for other models, although I would expect it to be ok with all the newer nuvi sets. If you're not confident it works on your model, please do not install this keyboard. This keyboard is provided as is and does not carry any warranty or legal obligation whatsoever. NOTE: If you already have an British English keyboard in your unit, move the original file away from the keyboards folder to a safe place where you can retrieve it later on if needed (in other words, backup! ).